(CNN) - Arizona Rep. Trent Franks, who served as former Congressional co-chairman for Michele Bachmann's presidential campaign, announced on Friday he's now throwing his support behind Newt Gingrich. "America cannot afford another four years of Barack Obama, which is why conservatives must unite now around the one candidate who can offer the clearest contrasts with Barack Obama," Franks said in a statement. "That person is Newt Gingrich." 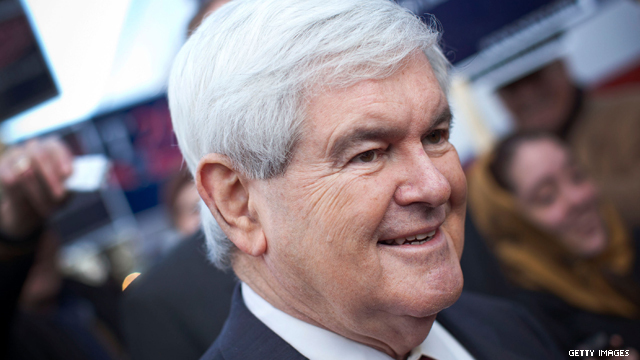 The move comes eight days before Gingrich competes in the South Carolina's primary. An American Research Group poll released Friday showed 25% of likely South Carolina GOP primary voters backing Gingrich, placing him in a close second behind former Massachusetts Gov. Mitt Romney. In his endorsement, Franks cited Gingrich's debate skills and "unmatched record of conservative achievement and job creation" as reasons for his support. Franks also contrasted Gingrich's record on abortion with that of Romney, saying the Republican presidential frontrunner, who once favored lighter abortion laws, would "have an impossible time mobilizing pro-life voters if he became the nominee." His remarks echo a recent attack strategy from the Gingrich campaign, which released a scathing ad this week hitting Romney over his changing tune on abortion. Bachmann boasted support from the four-term Arizona congressman back in early December. The congresswoman ended her presidential campaign one day after placing a disappointing sixth in last week's Iowa Caucuses. While Arizona doesn't hold its primary until February 22, the state's controversial immigration law has been a frequent topic of discussion in this presidential election cycle. - CNN Chief Political Correspondent Candy Crowley contributed to this report. Arizona Rep. Trent Franks, who served as former Congressional co-chairman for Michele Bachmann's presidential campaign.... Is that suppose to give him some kind of clout? Funny. Who? What is he doing? When did he come to this conclusion? Why ginGRINCH? Who Cares??? No one cares!!! I must admit I did not like Gingrich when this all started, but I am having more and more respect for him as each day goes on. I think he is telling the truth about Romney. I know Gingrich has had moral issues, but it is nothing in compare to Romney's moral issue. I will never vote for Romney, and if he is elected I will never respect him. No body has respect ffor scavengers. Not suprise here. I am sure this AZ clown also thinks that Spanish is the ghetto language! Where do these people come from? Where do they learn to be this stupid? Mr Gingrich is a contrast with President Obama. Mr Obama is intelligent, and thoughtful. Mr Obama sees a responsibility to all Americans, not just his friends. Mr Obama has integrity and treats others with dignity. Mr Obama is a great role model for all of us. Mr Gingrich is not Mr Obama. He is nothing like Mr Obama.